Thanks to camera phones, everyone is an amateur photographer these days, and there are hundreds of nifty apps to help you make the most of the limited camera quality. But once you’ve taken a bunch of photos, what then? If you’re anything like me, they just languish on the phone until you remember to take them off, and then you just upload them to Flickr or Facebook and forget about them. Perfectly functional, but boring. This is where Diptic comes in. Diptic is a fantastic, simple to use tool for creating basic geometric photo arrangements. More than just two photo diptychs (get it? ), Diptic comes with 19 different layouts, using up to 5 different photos. To use, all you have to do is select a layout and then tap on one of the open slots. You can then either select a saved photo or choose to take a photo through Diptic, and the photo will be automatically saved to your phone. Repeat for all the open slots. Once your photos are selected, you can move them around for ideal placement using the familiar drag and pinch zoom. You can also flip and rotate images by 90 degrees, although there’s no free rotate, so if you took a slightly crooked picture, you’ll have to fix that elsewhere sadly. But you can tweak levels and adjust the border before either emailing your completed masterpiece or saving it to your phone. The interface is dead simple and incredibly intuitive, so even if you’re usually all thumbs when it comes to artistic endeavors, Diptic makes it easy to transform your humdrum snapshots into a polished arrangement worthy of framing. Shooting with Diptic might even make you a better photographer, since the simple, but attractive layouts force you to think a little harder about how you want the finished product to look. 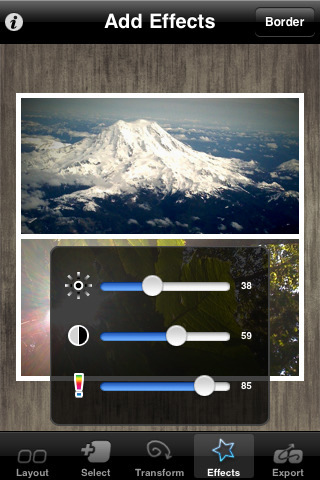 The only thing I didn’t really love about Diptic were the Effects sliders for brightness, contrast, and saturation adjustments. They’re rudimentary at best and very finicky to use. I’m glad they exist for quick side-by-side adjustments to photos, but they’re much too basic for any hefty image processing. I was also surprised there isn’t an option for uploading finished creations to Facebook or Flickr, particularly since they include a ready link to the Diptic Flickr pool. Browsing through the Flickr gallery, it’s clear folks are doing some pretty amazing things with Diptic, so I’m surprised the app itself doesn’t make it easier to share. That said, I really loved working with Diptic and along with Hipstamatic, it’s right at the top of my favorite photography-related apps. It’s easy to use and yields brilliant results, so if you’re out there taking photos with your iPhone, definitely consider picking Diptic up. 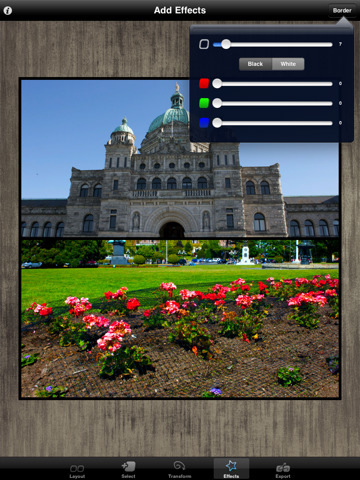 To begin you choose a layout from five options that allow you to combine two to three pictures. This was the most interesting part of the application for me because you can choose on a theme that connects each image or cut a photograph into two to three parts, abstracting the original. Once you have settled on which images to use you can alter each photo’s brightness, contrast, and color scheme. The application also allows you to choose the width and color of their frame and has the option to eliminate it altogether. After you put the finishing touches on your photography you can export it to your library or email. After all the hard work and effort you’ve put into your creation you you might as well show it off your on facebook so your friends can see it. Your photo albums will suddenly become the subject of envy and people will beg for your photo-framing secrets. At this point there should be a large smile on your face since the application didn’t even cost you a dime! AppSafari review of Diptic was written by Tracy Yonemoto on October 28th, 2010 and categorized under App Store, iPad apps, Photos, Universal. Page viewed 5514 times, 1 so far today. Need help on using these apps? Please read the Help Page. Free promocodes for Diptic courtesy of the developer. Leave a comment stating which number you are redeeming. Enjoy! I used #3 but 4, 5, 6 were also invalid.